Not a far cry sonically from the Sadies, who gave them a tip of the hat with a shout-out during their main stage set, Toronto-based Milk Lines leaned heavily towards the psychedelic edge of things with a short set in the warehouse ahead of their debut album release in September. 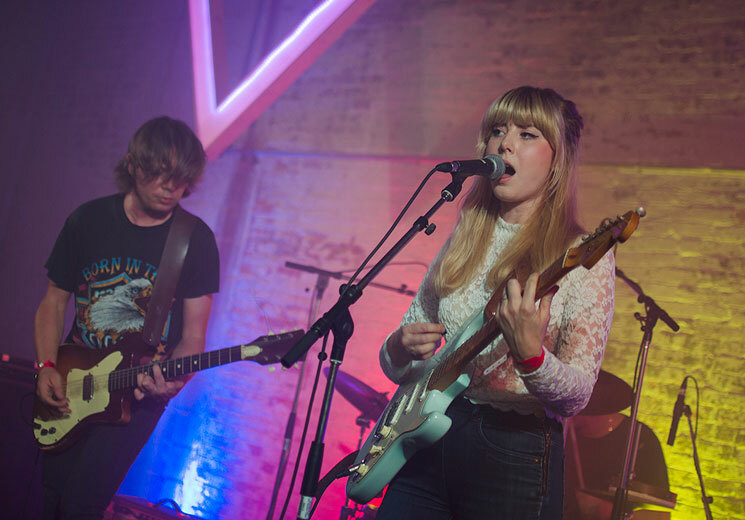 Two high-powered fog machines masked the four-piece band in billowing clouds of vapour; a perfect match for both their jangly psych-rock and smoky western sounds. Fighting through some guitar trouble in the early going, Emily Bitze's work on six strings complemented that of co-leader Jeff Clarke quite well, only strengthened by a formidable rhythm section. However, Bitze's softer vocal harmonies alongside those of Clarke unfortunately fell victim to a tough live mix, only able to punch cleanly through the wall of sound every so often. Technical issues aside, the performance was a good indicator of what to expect upon the arrival of their full-length next month.